I guess a part-time curate’s first Christmas could be considered slightly less of an achievement? Yes and no. But I did preach my very first Christmas Day sermon – complete with photos of some gems from the Clutterbuck Nativities Collection, and a legendary pop diva in the congregation. [I kid you not on that last point. Fortunately I didn’t find out about that until after the service!] I travelled through deserted London streets courtesy of a Muslim taxi driver who spent most of the journey quizzing me on how to cook a turkey – as I’ve never cooked one, I really wasn’t much help, but did recommend Delia’s Christmas. Downside of being part-time? Missing some of the Christmas lunches. Upside? Not having quite so many enforced mince pie eating occasions! To be honest, the biggest Christmas challenge was never going to be the work, but the fact that it was different to any other Christmas I’d had before. I’ve grown up with church-orientated Christmasses – where the priority was getting one, two, three or even four services done between Christmas Eve morning and Christmas dinner! I’ve been hauled into action on grey Christmas mornings to support parents’ leading worship – regardless of whether or not I was indulging in my semi-annual Christmas cold. But it turns out it’s rather different when it’s you that has the church to look after! A campaign had been underway to get me to spend Christmas Day in Harpenden for over a year – and where better place to spend Christmas than with a family of people you’ve known for over half your life, and who appear to have had a near-identical upbringing! Christmas with the Kilverts was different to a Clutterbuck Christmas (fewer nativities for starters), but it was good different – including Christmas quizzing, Christmas cheese, Christmas present notebooks [still reeling from the organisation level displayed on this one], and the Queen. Yes, the Queen. For the first time IN MY LIFE I watched the Queen’s speech. And you know what? It was really rather good and something to be stored away for a future sermon illustration. 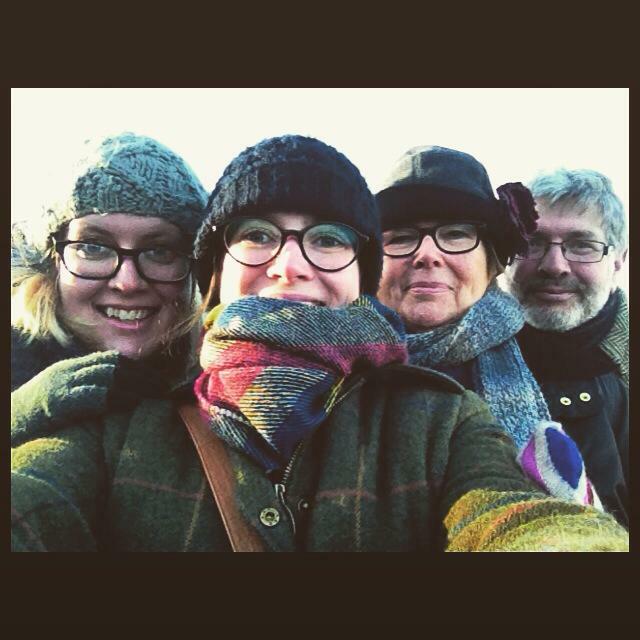 Anyway, huge thanks to the Kilvert clan for trekking to Highbury on Christmas Day, being in my congregation, and then taking me home with you and making me feel so much a part of the family!! The other alternative family was of course my London one. For a city whose population seems to flee in a mass exodus in the week leading up to Christmas, it was a surprise to discover that so many Matryoshka Haus-ites were in town over the holidays. Christmas Eve-Eve was spent enjoying great food with great company in the new building, while the following night was a lovely extended family meal at home. [Christmas: when three roast dinners in four days is considered not in the least bit excessive!] Celebrating Christmas with friends, my honorary niece & nephew [“aunty Liz” appears to be catching on as a moniker with the smallest housemates] was lovely and more than made up for the lack of actual family. Oh, and I put Father Christmas to the test and won. Twice. Stocking gifts arrived from Belfast, and then on Christmas morning a Christmas miracle occurred! 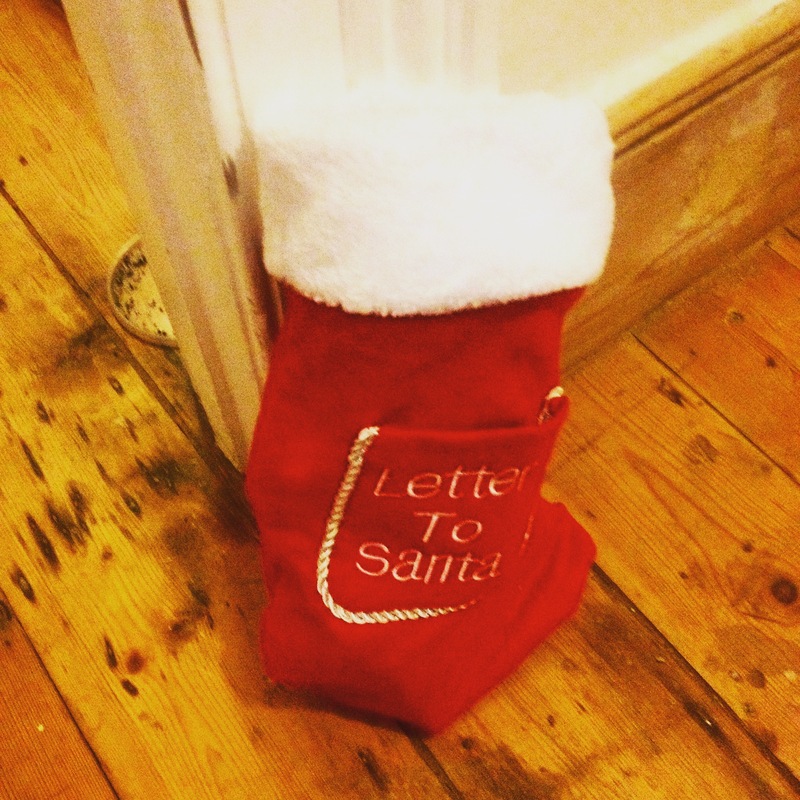 A stocking full of another set of presents arrived at my bedroom door. So it’s official, Father Christmas *does* exist! Well done fellow Deacons for surviving Christmas. Now, bring on Easter! On the one hand, I’ve missed the hustle and bustle of Christmas spent in the heart of a parish church, as the previous three years have been. The carol services prepared for; the Christmas sermons written; the community teas served at; and, most missed of all, Christmas dinner in my flat with the students. Marking the birth of Christ in seemingly every way possible. And time to visit other churches too. Sundays have been the most different to previous years. When I’m free on a Sunday morning (which, this past term has been a terrifyingly rare occurrence thanks to globe-trotting; guest preaching; weekends away; & potential future church visiting) I’ve been worshipping at St Peter’s Bethnal Green. 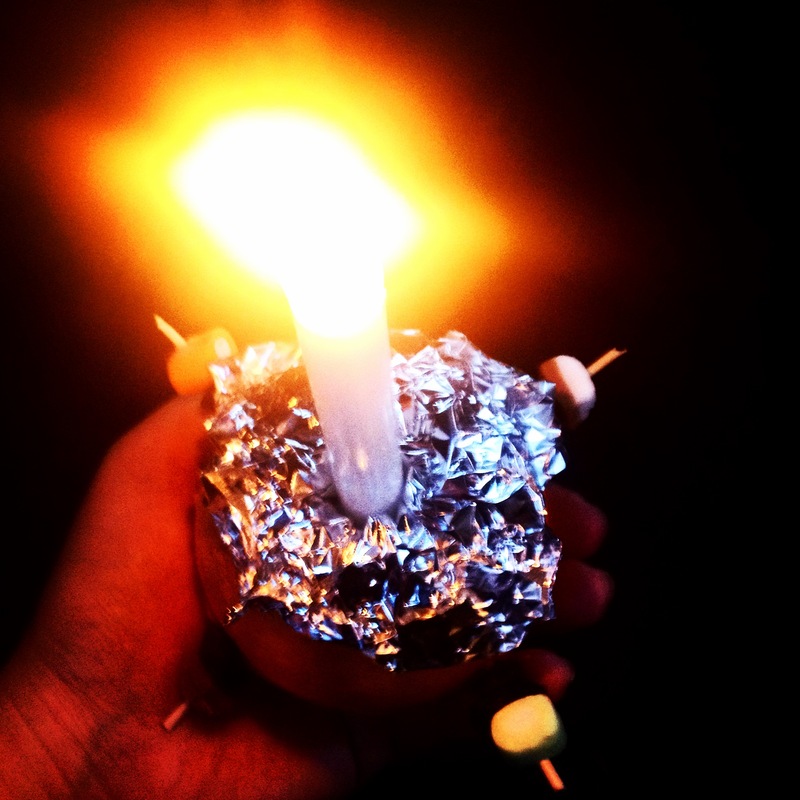 After a gap of some weeks, I felt thoroughly at home on my first Sunday back at their annual Christingle service – the first one I’ve been in the pew for since my very first experience at Westminster Abbey, when in year 7. Standing in a circle around the church, each of us holding a lit Christingle, in the dull light of a dark December morning, was very special. Christingle fruit & Dolly Mixtures – the Sunday breakfast of champions! A couple of Sundays later, on the final Sunday in Advent – when many London churches begin to suffer from what is known as the Mass Exodus – St Peter’s deviated from the traditional church carol service, and instead took its carols to the people. 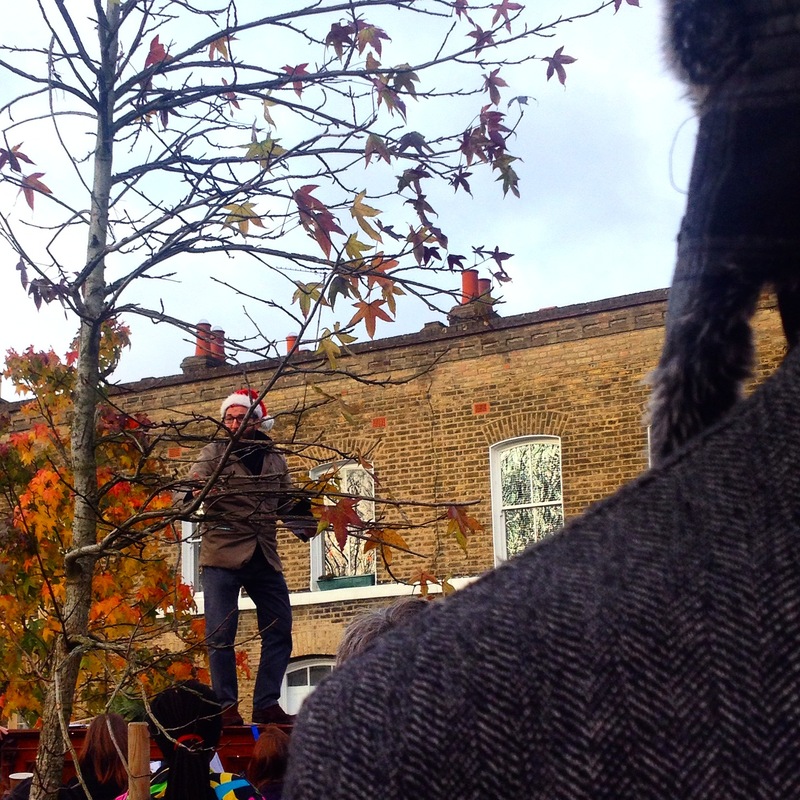 10.30am found a throng of carollers, flasks of hot chocolate and trays of cake, accompanied by a piano rolled through the streets from the church, at the top of Columbia Road – which on a Sunday is home to the famous flower market. I was late, and followed the sound of singing from across Jesus Green (an appropriate location for an outdoor service, no? ), and discovered that several residents along the Green had opened their doors and were joining in. It was a fabulous example of getting church out of the church building, and of the things clergy will do spontaneously – in this case, standing atop of a piano to read poetry. Impressive! Time also gifted me an experience I’d expected never to have again: a carol service at my church of seven years, St Mary’s Bryanston Square. My first ever service there was its carol service in 2004, and it resulted seven happy years worshipping there; becoming an Anglican; and ending up at theological college. 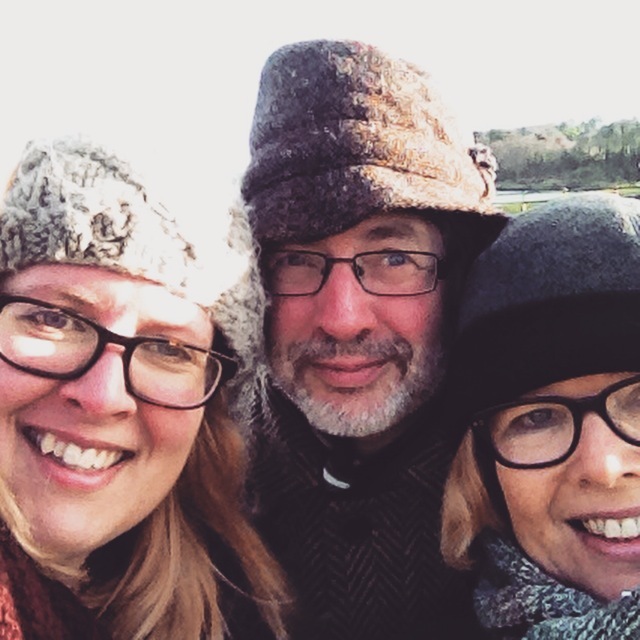 Carol services are a big deal at St Mary’s – I sang in six of them and loved every single second of it – when I participated in my last one four years ago, I knew it would be one of the things I’d really miss about the church. Sitting in the congregation of the morning Christingle Service, tingles went up my back the moment the singing began (helped by the fact that the first number was my favourite Christmas song this season – Do You Hear What I Hear?) It was all so familiar. The children sang the same song I’d helped teach the under 6’s sing year after year (the gorgeous Love Shone Down); I caught up with friends I’d not seen in ages; children I remembered as infants had grown up; and all in all it was a fabulous treat. Nowhere does Christmas like St Mary’s, and it was a joy to get another chance at it. The singers in action at St Mary’s. 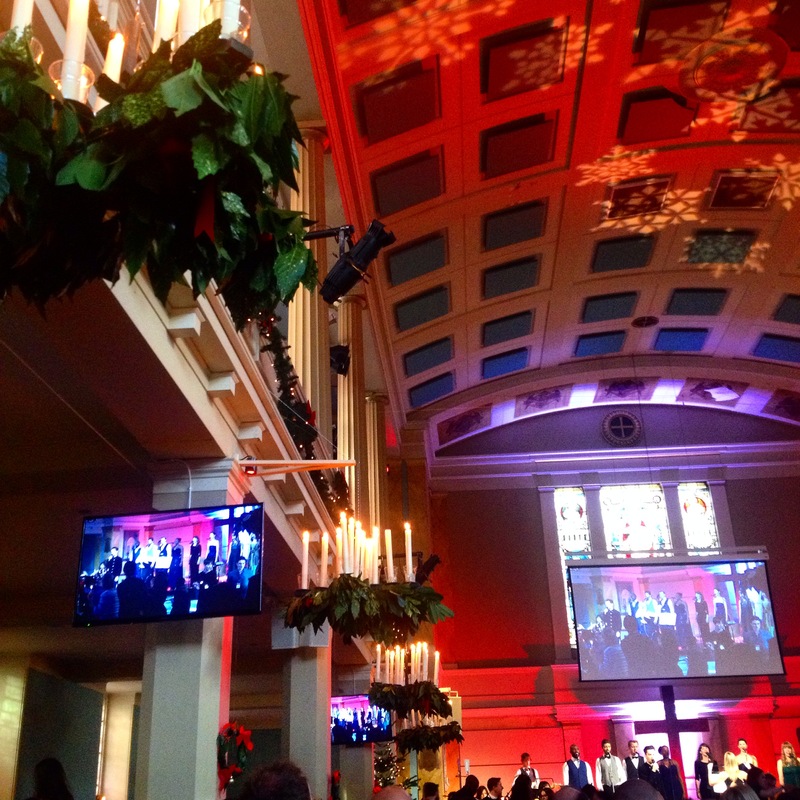 I’ve ‘done’ Christmas at a few different churches – there was also a more traditional carol service at Christchurch Spitalfields, supporting my singing flatmate, and a Christmas Eve making a first-ever visit to St Anne’s Cathedral in Belfast. Quite a change from only going to one, possibly two churches over the season. Most of all, this Christmas of non-parish commitments meant that I was free to spend Christmas itself wherever I wanted. I had the option of either a curry Christmas in Tewkesbury (my sister and brother-in-law have long held a desire to go to a curry house for Christmas dinner), or a traditional-ish Christmas in Belfast. I opted for the latter, knowing that Christmas Day in Belfast will be impossible in future years. The siblings arrived on Boxing Day (although bro-in-law has had the lurgy for most of his visit) and a good time was had by all. Tomorrow, we return to England, leaving emptier cake tins and much wine bottle recycling behind. Christmas in the Belfast Clutterbuck household has a very strong emphasis upon nativity sets. 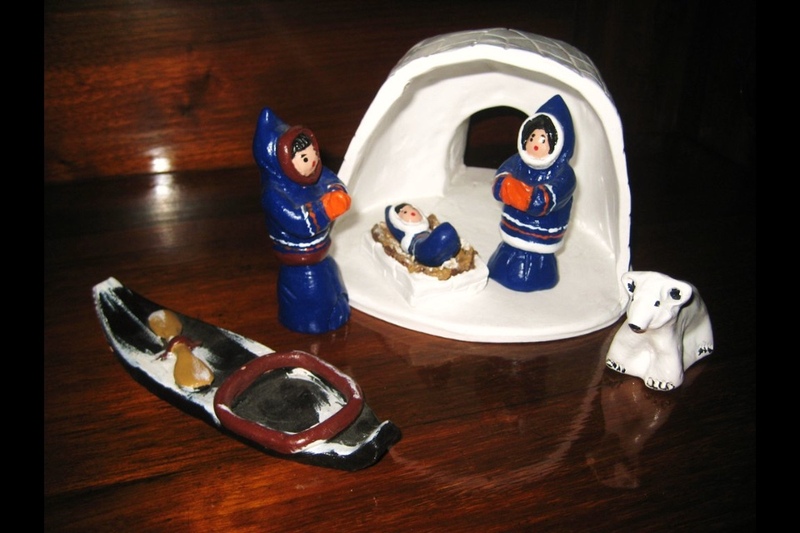 Long-term friends and readers will be aware that for some time, my mother has been collecting nativity sets from around the world. She receives them as gifts, and we’re always on the lookout for interesting new ones. I haven’t counted them (yet) this year, but we must be approaching 60. 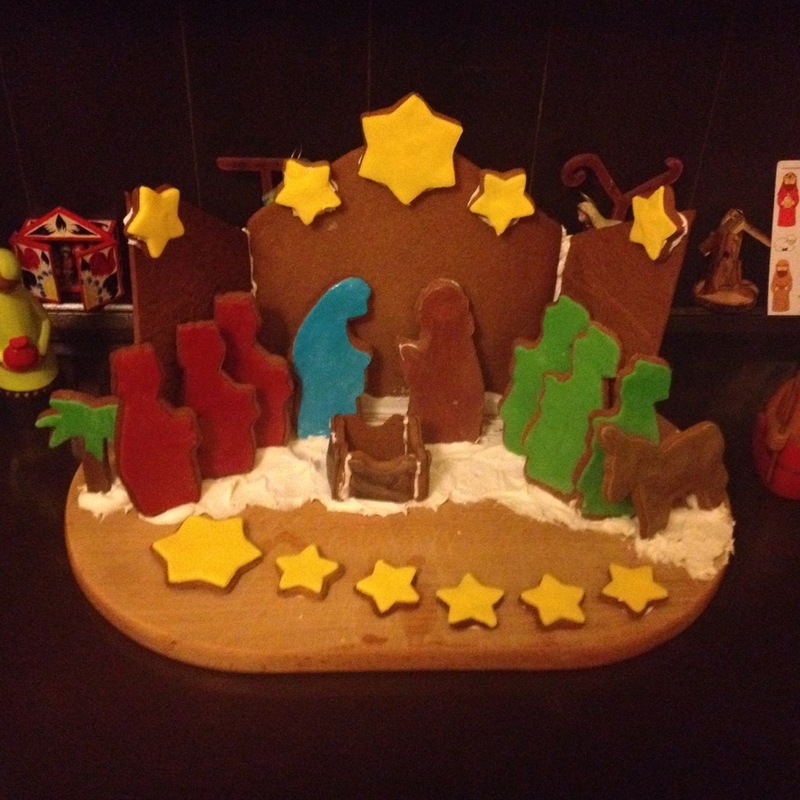 This year, one of the new nativity acquisitions (there have been several), was a Nativity Gingerbread set. I can’t remember which of us discovered it via Twitter, but it was a set of biscuit cutters from (of all places) Urban Outfitters [it’s now out of stock and I can’t find it anywhere else online]. 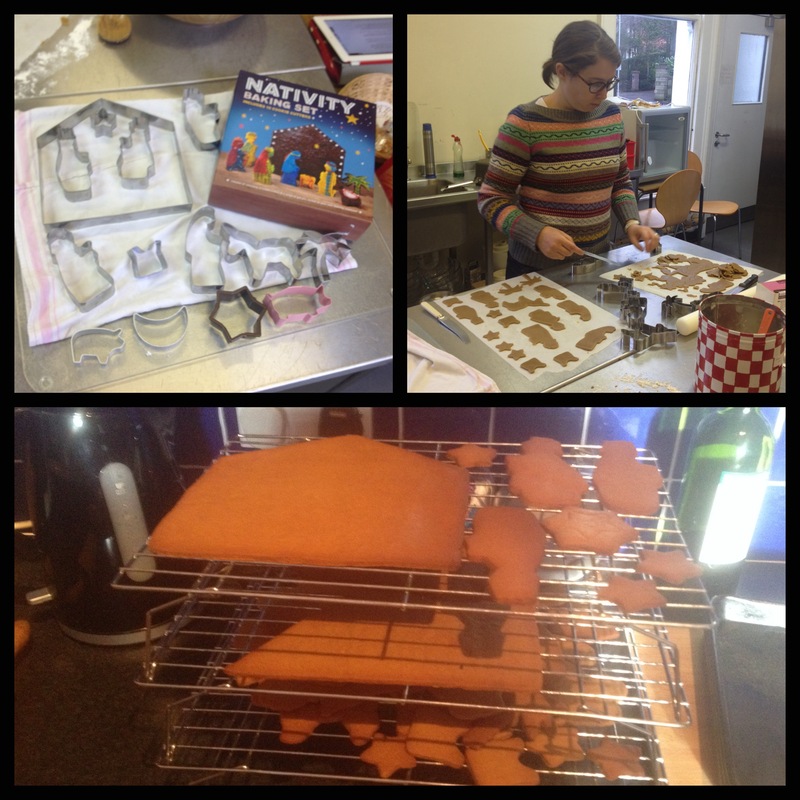 The basic premise is simple, you make dough, cut out nativity themed biscuits, and assemble. 1. That the manger ought to be three dimensional, in order to facilitate the placing of the baby Jesus within it. 2. That the stable needed doors. We had a cutter for the back of the stable. Cutting out a second, and cutting it in half, and sticking it to the back created an area in which to place the figures. The method was simple – we used Mary Berry’s recipe for a Gingerbread House, recently demonstrated on the GBBO Christmas Special. We used half the quantities for the gingerbread, and had more than enough. For the royal icing we used a third of the quantity needed for the house, but might have needed more than that, had we chosen a more elaborate form of decoration for the figures. As for the colour, it’s fondant icing, conveniently packaged in a pack of the ready-made variety. And it’s all brought together on a bread board. It was a fun activity, but perhaps could do with being spread out over a couple of days, rather than crammed into Christmas Eve. 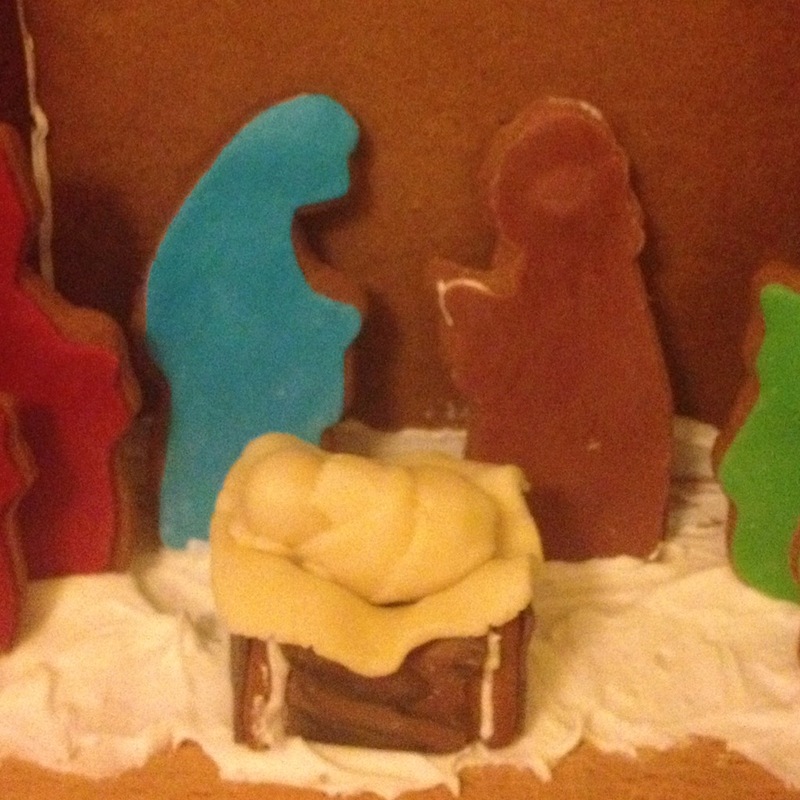 It was also lacking a few key features – including a Jesus cutter and an angel. We created our own angels (though the addition of them to the scene would have compromised its structural integrity); found a pig cutter (for extra livestock); and attempted to create a sheep via a combination of the pig cutter and a scone cutter (unsurprisingly, this did not work).